Chiltern Railways have been conducting some trials of DAS (Driver Advisory Systems) with a view to increasing fuel efficiency throughout their fleet. 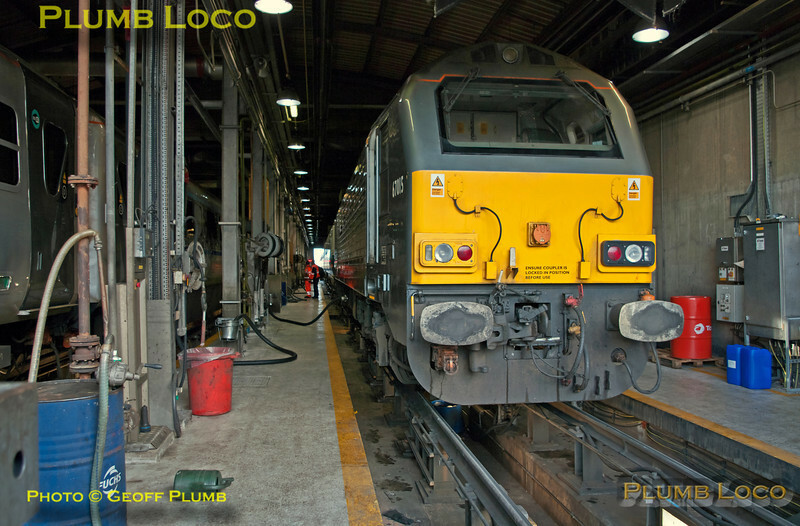 Previous trials have involved the use of 4-car 168 units but on Sunday 27th January 2013, the trials were done with a set of loco-hauled coaches (set AL04 in blue/grey livery), with 67015 and DVT 82304. I was kindly invited by Chiltern Railways to spend some of the day with the crews on the trains, running between Wembley LMD, Banbury and Marylebone. Several manufacturers have developed Driver Advisory Systems with the intention of reducing fuel use (some were originally used in the USA and probably elsewhere to prevent very long/heavy trains derailing when different parts of the trains were on different gradients, profiles, curves etc.) and are currently being introduced by quite a few TOCs & FOCs in the UK. The systems make use of track data (curvature, gradients etc.) GPS and timetable information to save fuel whenever possible, typically savings of around 10% are claimed but obviously this is dependent on various factors such as traction type, the presence (or otherwise) of slack in the timetable etc. Where the opportunity exists the DAS systems (which are advisory rather than mandatory) will request that the driver coasts or runs at a speed lower than the permitted line speed but whilst still allowing the train to meet the timetable requirements. This allows for savings in fuel and reduced brake wear. There are several other advantages as the systems can provide timely reporting of delays and also give the drivers access to accurate diagrams/schedules. Here are a few photos of the runs to start with, many more to add to fill in the gaps and tell the whole story! 67015 "David J. Lloyd" is being re-fuelled on No. 1 road inside Wembley LMD after arriving with 5E32 test train ECS from Marylebone. It had worked earlier as 5U23, 10:26 from Wembley LMD to Banbury with set AL04 (the blue/grey Banbury stock) and DVT 82304 as a control excercise for the DAS trial train after its fuel tanks were filled so that the consumption could be measured. It then ran back to Marylebone as 5H32, 11:48 from Banbury to Marylebone as the southbound control trip without DAS. After this re-fuelling, it then ran as 5U41, 14:26 from Wembley LMD to Banbury with the DAS in use, in order to compare fuel usage with the non-DAS runs.13:43, Sunday 27th January 2013. Photo taken with permission and under supervision. Digital Image No. GMPI14000.